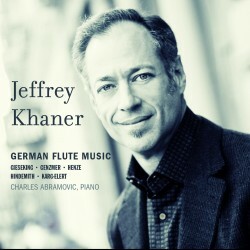 Through his previous five releases on AVIE, flautist Jeffrey Khaner has become a familiar face whose performances never cease to please and astonish in equal measure. Principal flute of the Philadelphia Orchestra, his extensive forays into the solo canon have cast him in a glowing spotlight. Revered by flute players world-wide, his music-making has also been a delightful discovery for scores of classical music fans. German Flute Music will be no exception as it traverses some rare corners of the flute repertoire, ranging from delightfully melodic works by turn-of the-century composer Sigfrid Karg-Elert and Walter Gieseking (better known as the great pianist), who was an almost exact contemporary of Paul Hindemith who in turn was a teacher of Harald Genzmer and a great influence on Hans Werner Henze.